The Four Preps 1958 hit song had it right, but its only half the story. 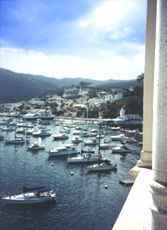 On a four-day autumn voyage to Southern Californias fabled isle, my wife and I not only soaked ourselves in the romantic ambiance of Avalon village and its Casino ballroom, but we also enjoyed the adventure offered along Catalinas beautiful coastline. Our days were filled with mountain biking, coastline kayaking, snorkeling in fish-rich kelp forests, beach lounging, strolling the village and harbor promenade, and relaxing in cafes and restaurants. Our evenings were filled with the sounds and action of multiple bands playing at the Jazztrax Festival, one of several performing arts events held annually at the Casino ballroom. 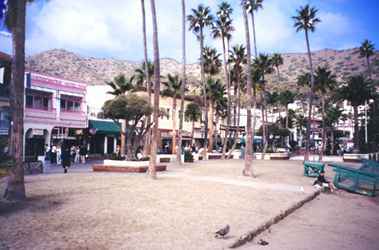 Come visit with us and make Santa Catalina your own island of romance and adventure. When Juan Cabrillo discovered the island in 1542 it was home to 2,500 Indian villagers living peacefully as fishermen and seal hunters. Santa Catalina was left to its natives until fur traders discovered its sea otters in the early 1800s. 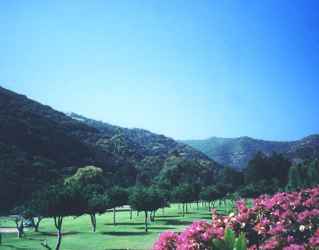 The last Mexican Governor of California deeded the island to an American cattle rancher in 1846, who sold it in 1887 to the developer of a sport fishing tent village, later called Avalon. The village burned to the ground in 1915. William Wrigley, Jr., the chewing gum magnate, purchased the island in 1919, and devoted himself to its development and conservation. He and his wife built their mansion overlooking Avalon in 1921 and sold lots for new home construction in the village. Wrigley funded the 1923 construction of the steamship Catalina to transport island visitors, and the 1929 Casino ballroom that hosted the most popular big bands of the 1930s. As owner of the Chicago Cubs, Wrigley built a ball diamond and instituted the Cubs spring training camps here. During WWII the island became a U.S. military base closed to the public. After the war, Williams son, Philip, continued his fathers tradition of island preservation, deeding his land to a nature conservancy holding 86% of the island. Its hard not be enraptured by Avalon. You start to fall head-over-heels in love with this place as your mainland ferry glides into the harbor filled with pleasure craft. A short walk from the terminal brings you to Crescent Avenue, the pedestrian palm-lined promenade curving around the harbor and its beach. Along the avenue opposite the beach is a lineup of shops, cafes, restaurants, and bars with a mixture of 1920s Spanish-American and Cape-Cod-like facades. The picturesque hillside above the harbor brandishes the original Wrigley mansion (now the Ada Inn B&B) and Holly Hill House, a beautiful 1889 Victorian home. For an even more intense 20s feeling, have breakfast at Sallys Waffle Shop, a 10-table and stool-counter restaurant on Crescent Avenue that serves up great waffles and eggs. Later, as you stroll or bicycle the village streets back from the harbor, youll continue to feel the 1920s vacation village ambiance. One of the more interesting homes is found on the corner of Third and Descanso, built around the deckhouses of two old Catalina Channel steamer boats. Avalon Canyon and Gof Course As you continue your village explorations it will suddenly strike you -- theres very little traffic on Catalina. Most of the vehicles are golf carts, and these are limited to one per island family (4,000 residents, total) and a small number of visitor rental carts. Although there is a road that winds along the islands mountainous spine, it is gated and accessible only with a special permit. This rarity of vehicles is great for strolling or bicycling visitors. We rented mountain bikes for the duration of our stay on the island and enjoyed the traffic-free streets and shoreline roads running for a mile north and south of the harbor. We also enjoyed the cycling and scenery along Avalon Canyon Road, running two miles up from Avalon past the golf course, stables, baseball diamond, campground, and manzanita vegetation to the Wrigley Memorial and Botanical Gardens. Our most pleasant surprise on Catalina was the abundance of marine life to be enjoyed while taking advantage of Catalinas sporting opportunities. An enjoyable afternoon was spent snorkeling in Lovers Cove, the marine preserve just south of Avalon harbor. Here, as we snorkeled above an undersea forest of bladder and ribbon kelp, we viewed beautiful orange Garibaldi (Californias striking state fish) and large schools of Opaleye, smelt, sardines, and occasional bass, Rock Wrasse, and mackerel. For a slightly different perspective we took the one-hour semi-submersible submarine tour of the cove and enjoyed the same fish life at "eye level," six feet below the surface. We ventured forth another afternoon on a rented double kayak from Descanso Bay Beach Club and were pleased to come across a plentitude of birds as we followed the rugged alee coastline north from Avalon. In a single outing we viewed a huge bald eagle and multiple pelicans, gulls, cormorants, and crows. Divers and sport fishermen will also find several alternatives to exercise their preferred pastimes in the waters off of Catalina. Additional tour options for the visitor include an Inside Adventure Tour by bus through the center of the island to view native deer, wild boar, and non-native buffalo. We loved the music we heard at the Jazztrax Festival in the Avalon Ballroom with its excellent acoustics. The weekend of our visit included such popular jazz performers as Spyro Gyro, Tom Scott, and Kirk Whalum. Just as much fun as the music was the ambiance of the ballroom itself. It sits on the top floor of the Catalina Casino building on Sugar Loaf Point at the northern end of Avalon Harbor. 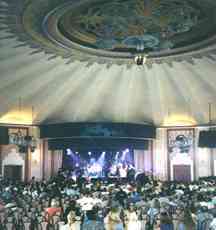 The domed ceiling stretches over the 138-foot diameter of the huge ballroom, which is used for dancing, dining, or concert seating. The name Catalina Casino comes from the 1920s when "casino" referred to a grand dance pavilion. Grand it remains, as the list of annual Casino events includes a Valentines Dance, Conservancy Ball, Swing Dance Camp, Fourth of July Dinner and Fireworks, Island Luau, Surf Music Festival, Jazztrax Festival, Halloween Swing and Costume Ball, Art Festival, and New Years Eve Celebration -- something for everyone. In four glorious days we felt we had gotten to know, love, and appreciate Santa Catalina. Now why hadnt we decided to make our reservations for a few more days? Well, well just have to follow up on our love affair with Catalina by scheduling a return visit soon. What are we doing next month? Santa Catalina is a-waitin' for me. 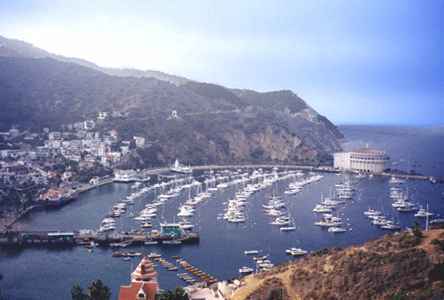 Click here for details to plan your own trip to Santa Catalina Island, California.